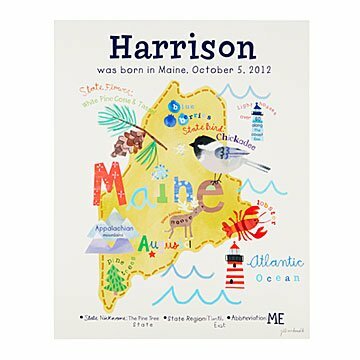 Celebrate your baby and the great state where they were born with this personalized artwork. Bright red cardinals, 2,000-year-old redwood trees, or mountains as far as the eye can see: your state is something special. Add one more reason to visit (at least for Grandma): your little one. This personalized birth announcement displays your newborn's name and birthdate, and celebrates your home's unique features, from lakes to landmarks. It's a keepsake for the proud parents with plenty of hometown pride. Designed and made by Jill McDonald in Missouri. This product arrived in a flimsy cardboard type envelope. It was of course creased where it left fold marks and wrinkles. Doesn't matter if you mark do not bend/artwork enclosed. The postal service is gonna do what they do. This product should be properly packaged so it doesn't arrived ruined. I was really looking forward to giving this to my new grand daughter for Christmas. Now it is not presentable. Unique gift for a new baby! A bit out of my element buying baby gifts. I love the unique gifts I have found on the site for othe occasions. The recipient was blown away by this item. Very memorable and made a great impression. Quality work, beautiful print. Very pleased with the artwork and my purchase. Great gift idea for a new baby! I bought this for a friend that just had a baby & she loved it! It really is a unique gift & I know I'll be purchasing more as friends & family have more babies. Vibrant, sweet and just what I wanted! I bought this as a gift for my niece's first birthday. While she can't quite appreciate it yet, mom is thrilled. The art mixed with some information works great for the nursery. I can see it moving into a young girl's room and maybe even a teen...maybe, I guess it depends on the teen. If not when a teen, then it will be waiting for her she moves to the next phase of her life where she wants to celebrate herself in artistic rendition. The only thing I'd wish for is the print to be framed, but I realize it's hard to ship in frames. Great product, Recipient Loved It! My future sister and brother in law loved this announcement for their new baby! It's so unique and personlized in ways that will make it stand out from other gifts with the state background and would look great on any nursery wall!